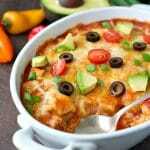 With only 5 minutes prep this Chicken Enchilada Casserole is comforting, wholesome and utterly delicious. Perfect for busy weeknights! Preheat oven to 350F (180C). Spray a 2-quart baking dish with nonstick spray. In a large bowl, toss together chicken, half of the enchilada sauce (about ¾ cup) and half of the cheese (about ½ cup). Place 4 of the tortillas in the bottom of the prepared dish, tearing them as necessary to cover the bottom (overlapping is fine). Top with half of the chicken mixture and drizzle with ¼ cup of enchilada sauce. Repeat layers one more time. Cover with foil and bake for 30 minutes. Uncover, sprinkle with remaining ½ cup of cheese, and bake for an additional 5-10 minutes (until cheese melted and casserole is hot and bubbly). You can store leftovers in the fridge for 2-3 days or store in the freezer in suitable containers for up to 3 months.